Configuring Office 365 settings is a must for creating Office 365 accounts for users via ADManager Plus. Since the account provided here will be used for creating new accounts in Office 365, ensure that you provide an account with the necessary privileges. Under Custom Settings, select the Office 365 link. Note: Ensure that the MSOnline PowerShell module for Azure Active Directory is installed on the same machine where ADManager Plus is installed. Click here for any help/information regarding installation of Azure AD module. Click the Add Office 365 Account link located at the top right corner of 'Office 365' page. Enter the User Name and Password of the Office 365 account which has sufficient privileges (Global Admin) to create new accounts. Select the domains to which the Office 365 option should be provided. You can edit the existing Office 365 tenants configured in the product. If you are using an account which has DirSync enabled, you can choose a different Source Anchor other than the objectGUID if you wish. To do this, click the relevant account from the list of Office 365 accounts displayed in the 'Office 365 settings page', select the desired 'Source Anchor' and click Update. Before you set out to add an Office 365 account in ADManager Plus, ensure that you MSOnline PowerShell module for Azure Active Directory is also installed on the machine where ADManager Plus is installed. 64-bit version of the Microsoft Online Services Sign-in Assistant, which can be downloaded from this page. 64-bit version of the Windows Azure Active Directory MSOnline Module for Windows PowerShell, which can be downloaded from here. Execute the below cmdltes by running the PowerShell as administrator. 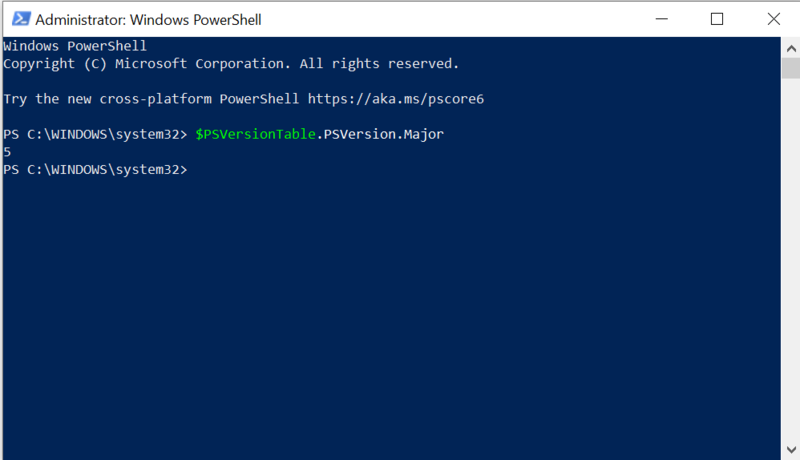 Run the cmdlet shown in the image below to check the version of PowerShell installed on the machine where ADManager Plus is running. - For PowerShell versions 3 or 4, ensure that the PowerShellGet and PackageManagement modules are already installed. To check if they are installed or not, run the cmdlets mentioned in the images displayed below. The user name or password entered is incorrect or there could be a problem with the user account. The user name was entered in an incorrect format. The user account could have the Azure Multi-Factor Authentication enabled; Microsoft does not currently support using the Azure Active Directory Module for Windows PowerShell to connect to Azure AD. For details, visit this page.